She was presented with her prize by Paul McLean, managing director of McLeans Bookmakers, the largest independent chain of bookmakers in Northern Ireland, and congratulated at a special ceremony in the city by Martin McGuinness, the deputy First Minister, also a keen fly fisherman. 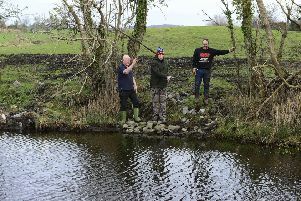 Dr McClenaghan, Executive Director of Lifestart Foundation, an education charity, and a former lecturer at the University of Ulster, has been fishing for over 25 years after her father Michael Doherty bought her a rod as a birthday present. Her biggest catch yet was an eleven and a half lb. salmon on the River Faughan. She said: “I was absolutely stunned when I heard I’d won the prize. I couldn’t believe it.